Dr. Prior and the finished bow. Text & images by Stuart Prior. In June 1961, the Eclipse Peat Company opened up some new areas for peat extraction on the Somerset Levels. Deep in the peat, one-half of a wooden flat-bow was discovered. This bow was found to date from the Neolithic Period, and was given the name the Meare Heath Bow. The following article is an account of the re-creation of a working replica of the Meare Heath Bow, which was carried out using the tools, materials and technologies available to the indigenous Neolithic population of Somerset. Through the re-creation and testing of the bow, hypothesis and interpretations previously attributed to the bow, and consequently to Neolithic bow-making in general, are examined and re-appraised. 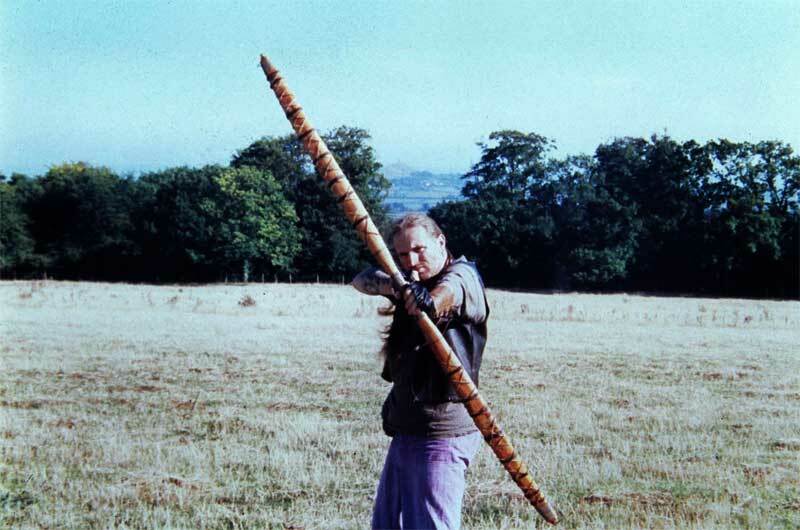 The conclusions reached include the fact that the Neolithic bowyers were skilled craftsmen and designers, capable of producing highly advanced weapons for the time, and that the Meare Heath Bow, which was previously thought to have broken in use, was probably intentionally broken, perhaps to be deposited as a votive offering in the Somerset Levels. The reconstruction of the bow was undertaken in the summer of 1997, and two publications subsequently appeared (Prior, 2000 a&b), but this is the first time that an unabridged version of the account of the reconstruction of the bow has been published. The replica Meare Heath Bow has now been shot over 3000 times and is still going strong, illustrating the functionality of its design and the durability of the weapon. Archaeology contains many sub-disciplines and one such is Experimental Archaeology. Experimental archaeology is the controlled replication of ancient technologies in order to provide hypotheses that can be tested by actual archaeological data. Through this field many ancient tools, buildings and artefacts have been re-created in order to learn about the processes of manufacture, usage and decay. These experiments have shown that many of the traditionally held views, about the ways in which tasks were carried out, things were constructed, or the ways in which various objects functioned, are actually ill founded, and many previously held notions about the past have subsequently been challenged. One area where experimental archaeology has really come into its own is within the study of ancient archery, or to give it its proper name Archaeotoxophily (Archaeology = the study of antiquities; Toxophily = archery). Experimental archaeology has been used to great effect within archaeotoxophily and much has been learnt about the bows and arrows that the discipline has been applied to. The bows from the Mary Rose have been re-created (Hardy, 1976), as has the Ice Man’s bow (Spindler, 1993), telling us much about artisanship and bow technologies of these periods. Flint arrowheads have also been made and tested, and their effectiveness has been proven thrice over. The story is far from complete however, and for every question answered two more have arisen. Much knowledge may have been gleaned concerning the field of ancient archery, but there is still much to learn. Figure 1 – The Meare Heath Bow. In June 1961, the Eclipse Peat Company opened up some new areas for peat extraction on the Somerset levels. Deep in the peat one-half of a wooden flat-bow was discovered (Fig. 1). The bow fragment was immediately taken to Cambridge University and subjected to carbowax treatment to preserve it. This bow was found to date from the Neolithic Period and was given the name the Meare Heath Bow (Clark & Godwin, The Illustrated London News, Feb 10th, 1962). The remains consisted of about half a bow of yew, broken across so that some 6cm’s of round-section handgrip remain. The rest of the bow-stave, about 93cm’s in length, take a flattened lanceolate shape of maximum width about 6cm’s, almost flat on one surface (the inner or belly of the bow) and convex on the outer (or back) of the bow. Part of the sub-terminal notch for attachment of the bowstring also remains. There are two transverse leather bands around the stave at its widest point and traces indicate that others were also originally present. In addition, there were clear traces of a narrow diagonal cross banding by strips of strengthening material, probably sinew. If the bow were originally symmetrical about the grip, its total length would have been around 190.5 cm long. The age of the bow was verified in several ways. Firstly, stratigraphically the bow was found near the base of a dark humified peat previously known to have yielded a polished Neolithic axe of Graig Llywd stone and several sherds of a late Neolithic bowl of Peterborough ware (Clark & Godwin, The Illustrated London News, Feb 10th, 1962). Secondly, analysis of the sub-fossil pollen grains in the peat sample, taken to Cambridge surrounding the bow, showed the bow to have been deposited at a time shortly after a general decline in Elm pollen that is known throughout Northwestern Europe during the Neolithic Period. Also present were pollen grains of plants associated with the spread of Neolithic farming. Thirdly, the radiocarbon analysis gave results fully consistent with these findings, 2690 BC ± 120 years. The bow then can be placed firmly in the Middle Neolithic Period. In terms of published results, prior to the current reconstruction, two reproductions of the Meare Heath bow have been made. The first bow was made in the 1960s by a Mr C.E. Lilley, and more recently, another was made by a Mr E. McEwen. It appears however, that both Lilley and McEwen used modern tools to make their bows, and neither reconstruction has been rigorously tested. Mr Lilley’s Bow’s draw weight was apparently measured, but the results were never published. It was however, shot by an archer at Dunster’s ‘Grand Western Archery Society’s’ meeting in May 1963, where an experienced Bowman hit a target at the third draw from a range of 60 yards (Clark, 1963). McEwen’s bow’s draw weight was published, 41kg (90lbs) at 81cm’s (32″), but the bow broke during the tillering process and was repaired with glue, and a backing strip was added. The backing was a tough elastic strip of hickory; this strengthened the bow to make it usable but also inevitably increased its poundage giving an incorrect reading for the bow (Bergman, McEwen & Miller, 1988). Therefore, a proper reconstruction was necessary to answer a whole host of questions. The first being, why bother reconstructing the bow? I enjoyed reading your article on the Meare Heath bow and wondered if you’d have time to answer a question I have about how you applied the bindings/wrappings and what the process was..
I’ve made an Elm bow that would work very well in this style and would love to try this out. Which of the bindings are you referring to David? Do you mean the rawhide? Well looking at Figure 1 in this Part 1 of the article, the sinew is wrapped around the tips but what is used for the horizontal bands and the webbing? They appear to be different, are they just different width leather strips? Also, I assume a form of glue used to fix the elements to the bow, the sinew and the hide?